Jenny, Mary, and Nora Hawkins jointly own and tend 320 acres along Bear Creek in Eastern Oregon, just outside the town of Wallowa. The sisters are the fourth generation of the Hawkins family to cultivate crops and livestock on the land purchased by their father’s grandparents, and they recognize the responsibility—and privilege—that comes with that legacy. Together, they work to steward healthy and productive land, some of which is leased to the USDA’s Conservation Reserve Program. The Hawkins sisters keep about 900 Cornish Cross chickens (the focus of their business), a gang of Broad-Breasted turkeys, horses, a few laying hens and a couple of pigs in their barnyards. The chickens are fed a combination of locally grown wheat and legumes, organic fish and camelina meals, and are frequently rotated to get the maximum protein from the lush pasture. Mary, who raised goats and studied slaughter capacity in Glenwood, New York, is the mastermind behind the chicken operation. While there, she imagined the possibilities for improving elements of the supply chain and poultry production for small-scale producers. She promptly returned to Wallowa, put together a brood and business, and drew up plans for a processing facility. 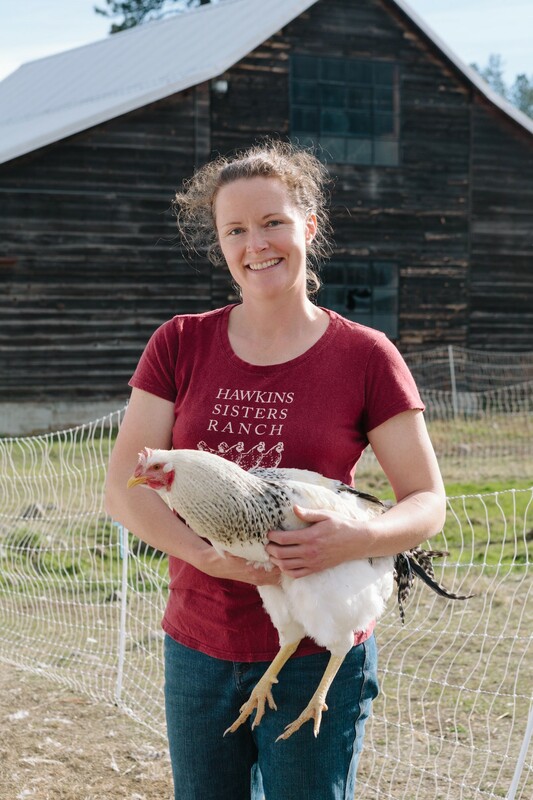 Today, Mary runs one of the only inspected facilities east of Boring, OR (300 miles away), allowing her to apply exacting standards to the handling of her birds, from birth to slaughter and sale, as well as those of local families and other small producers.